Free whitening for all new patients! A $297 value, with a paid exam and cleaning – must be 18 or older. Please call 614-451-2234 or Request Online! Just don’t forget to mention this ad. First time with us? Check out Patient Information for more info. We invite you to our practice! It would be our pleasure to have the opportunity to provide your dental care. Our primary concern is to make you feel comfortable! We will be your dental advisor and partner in maintaining your dental health for a lifetime! We provide a full range of technologically advanced dental services for all ages. We listen to your concerns and goals and provide a solution for existing and potential dental problems. You are encouraged to take an active role in asking questions and making decisions about treatment choices. Most patients feel that they really understand their dental situation like never before. Our philosophy is to respect our patient’s time. We make every effort to remain on schedule and complete your treatment in as few visits as possible. Our entire staff looks forward to meeting you. Please stop in or call the office to reserve your new patient exam. Feel free to explore our website, to help you become more familiar with our office. We would be honored for you to join our practice. We will strive to be your trusted providers for a LIFETIME OF DENTAL HEALTH. 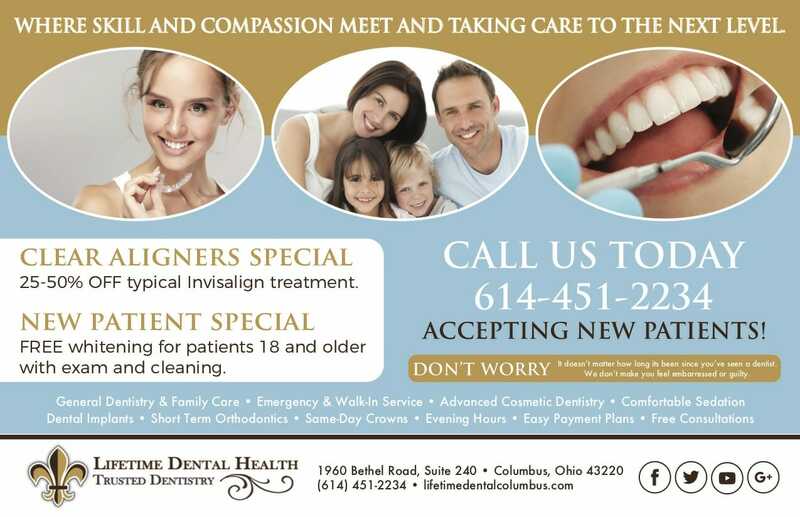 Call today to receive the gentle, high quality dentistry you deserve. Please call 614-451-2234 or Request Online for your preferred appointment. First time with us? Check out Patient Information for more info. *A $297 value. Mention this ad to receive credit. You can also choose a $50 gift card. Valid for new patients only, offer applies with a paid cleaning, exam and x-rays, 18 and older. Offer lasts until 12/31/2017. Not valid for emergency services.